Now that I am finished with my exams, I can start sharing my favourite summer outfits! I'm so excited they are finally over so I can start enjoying this weather. How it looks your favourite summer outfit? For me it's important to look nice and to be comfortable. I choosed striped pants which are super loose and comfy as well with this lovely white offshoulder blouse. They are a perfect match. I needed to add bandana around my neck because I think it gives it summery vibes. Someone would say it's not a good fit with pants because of it's stripes but they are a perfect match! What's more perfect for summer than mules?? I'm so obsessed with them, because they look nice and they are comfy as hell and they still have a heel! I love wearing heels, I think that everything looks better with them. It's very important to me that I found once that are comfortable. Let's talk about this bag. I'm pretty sure everyone heard about Cult gaia bags, you can see them everywhere. From fashion blogs, Facebook, Instagram, everywhere! I found mine at my grandmas wardrobe. I was so excited when I found it. I was beyond happy and I couldn't believe that this is so old, it's older than me and it's still in great condition! I think it's going to be perfect for casual summer outfits, it's such a unique but go to bag and I think it's totally worth the hype! Tell me in the comments how it looks your perfect summer outfit? Very cute outfit! You look adorable in it. I love the handbag. So cute! I'm really loving the pants! Looks great! I love this outfit ! So beautiful. Such a well written post ! Wow, I've never seen a bag like that before. It's so unique. I love your watch too by the way. This is such a gorgeous chic outfit! I love how you styled the bag; I've been seeing it styled with a lot of full skirts or super feminine looks and I love how you wore it with pants. LOVE. You are rocking this look! Love it from head to toe! I have very similar mules and have been wearing them everywhere. Mules are truly so comfy and the heel makes me feel just a little bit taller, which I need :) Great find on the Cult Gaia bag! Their bags are amazing. I love this look!! The way you edit your photos are so unique. Love it!! That bag is amazing omg. It is the perfect statement bag for a summer look. I love it!! I love this summer inspired look! You are so beautiful and the tote is still need to get for myself! This outfit is so cute for summer, and it still looks dressy, too! Girl grandma has some hidden jewels huh??!!! I absolutely love that bag and need one asap!! I also love your outfit. You paired the purse with the right look. This post was awesome! I love how fashion recycles. I remember my Mom had this same exact purse when I was a kid. I used to love it! Your grandmother is the most stylish grandma I know for having this bag! I definitely agree this is the perfect summer look; so many trends combined into one look! I need to pin this look to my S/S inspo board! I love that top so much! I have been looking for some good off the shoulder tops for summer, I might have to stock up with a few of these! I have been on the hunt for a pair of palazzo striped pants! This look is so chic and perfect for summer. I have been seeing that bag over IG lately, it's so fun! Love the Cult Gaia basket bags.I saw them everywhere. I'm obsessed. My question is how many things can stay inside? If it's capacious? 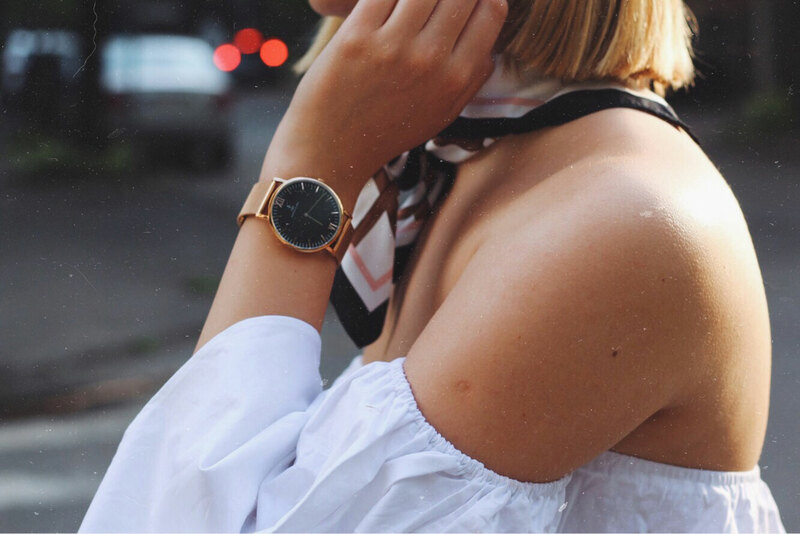 this outfit is so chic and your accessories are on point! Those trousars look wonderful. Mango are currently selling a similar pair in a beautiful bright mustard/white stripe combo. I keep going over whether to buy them or not! Argh... decisions haha! what a perfect summer outfit. your bag is just beautiful and i would love to own it myself. This whole outfit is perfection! 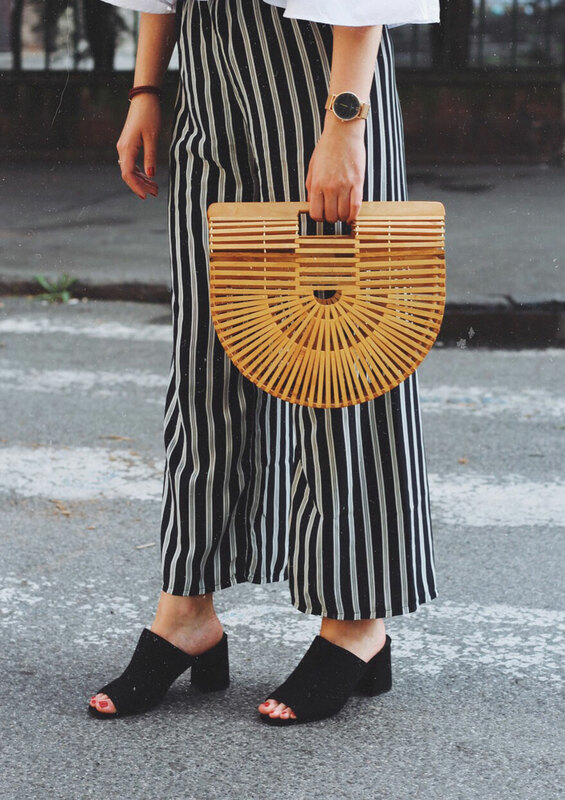 Everything from the OTS white top to the wide leg vertical striped pants and a statement bag. I love it so much! I need those pants! Love them! Woohoo! Also finished my exams #party #holiday #yay! This is most definitely a perfect summer outfit! I love the pants and the blouse is absolutely gorgeous! I really love how you tied the scarf and your bag choice is totally perfect! I have been looking for a pair of pants just like this! You look so gorgeous, I love the way you styled this look!! Love this entire look! So cute. And congrats on finishing your exams! Yes, I have seen these bags all year, I had no idea they were an old style remade. They are very cool, though I wonder how things do not stick out of them. There must be lining in there right? Hi Beautiful! I love the striped pants and the white over the shoulder top! Such a great look for the summer! Beautiful wide leg pants and I love the flattering vertical stripe! This top is such versatile summer piece I would wear it every day!